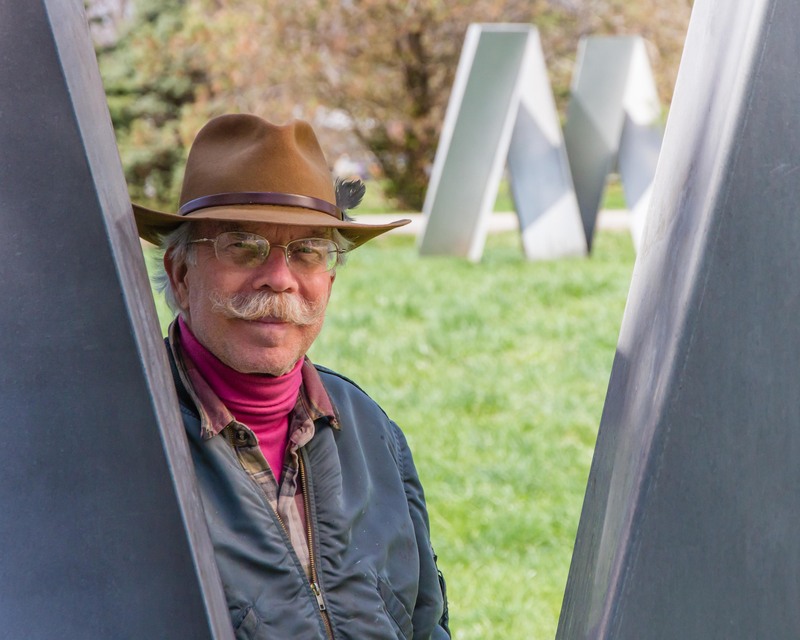 The photo above shows Jon Barlow Hudson in the sculpture garden next to his studio. Jon creates public sculptures. 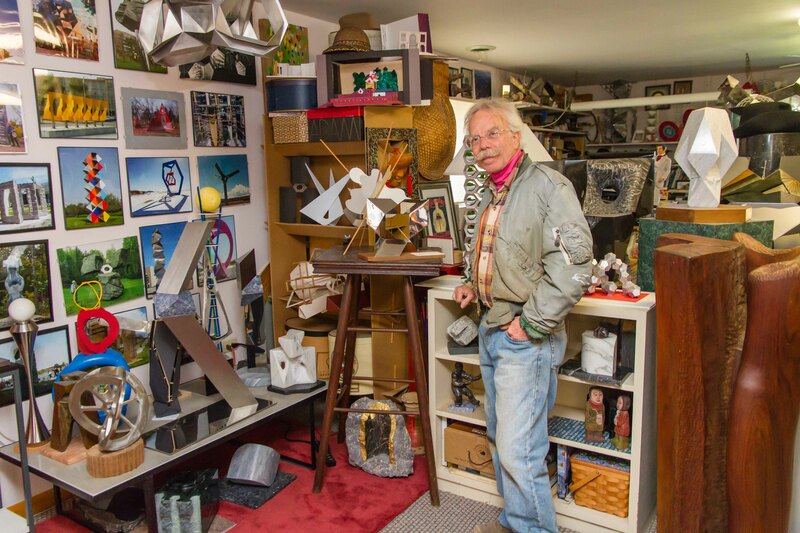 His work can be found around the Dayton area, around the country, and in 25 countries around the world. 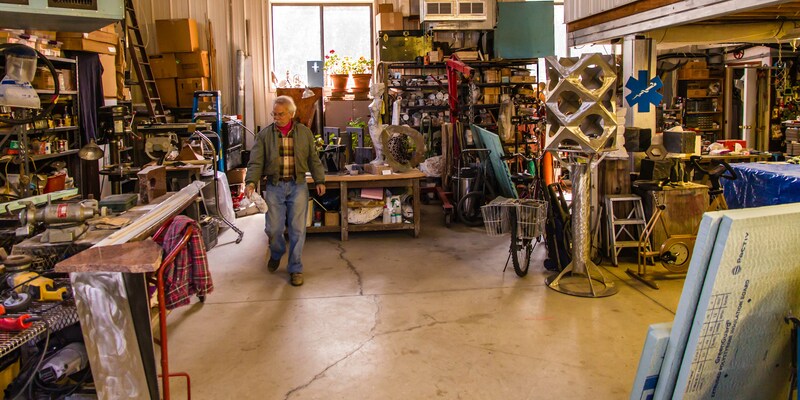 In 1985 Jon built this building on the edge of Yellow Springs to house his working space and his office. The building dimensions are a roomy 36 feet by 60 feet. The machining area has 17 feet of headspace, with an overhead crane to handle large parts. Jon told me that his projects typically start with a call for proposals. 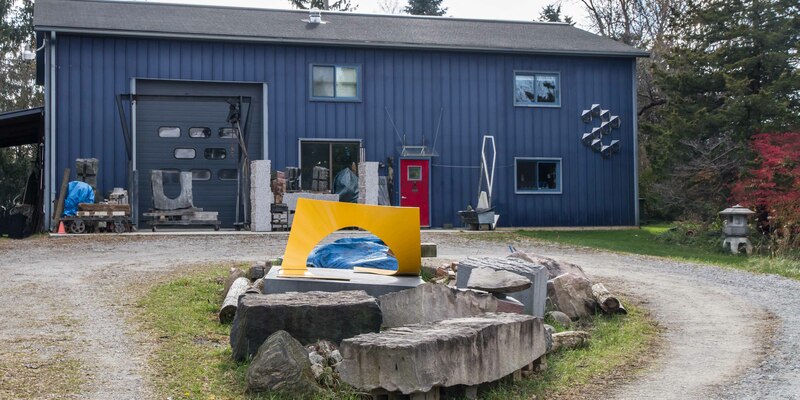 He and other artists who respond each make a model of their proposed sculpture called a maquette Photographs of the maquettes are then sent to the jurors. The maquette below was recently built in response to a call for proposals from Los Angeles. 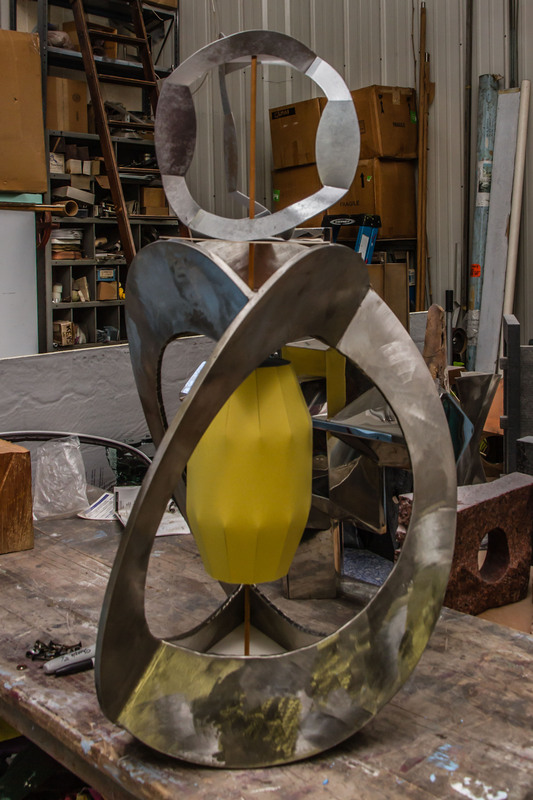 If it is selected, Jon will build and install a public sculpture 15 feet high. In the sitting room in Jon’s office you can see a number of maquettes, plus photographs of many of his installations around the world. His largest sculpture so far is 100 feet high. It was installed in Brisbane, Australia for a World Expo. 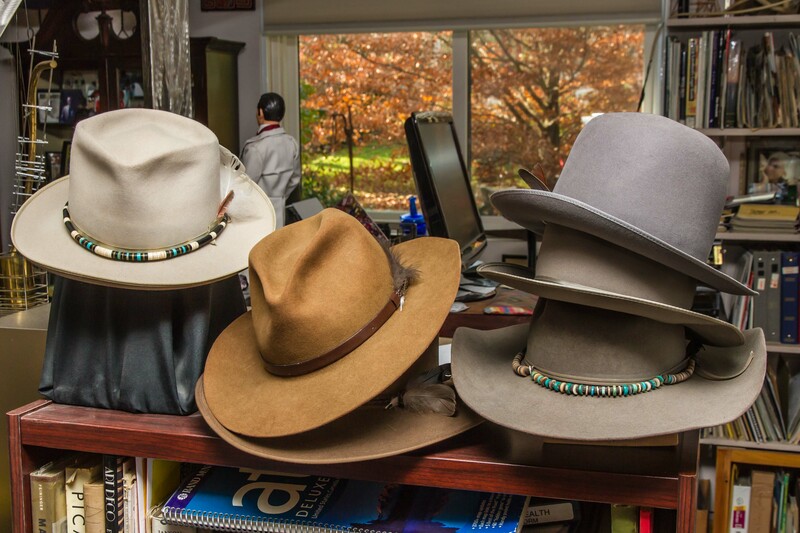 The office area is also filled with hats. As part of her doctoral research in costume history Jon’s wife and creative partner, Debbie Brush Henderson, put together a wide-ranging collection of hats. The hats have been exhibited in several art museums. I asked Jon about his background. He told me he lived in many parts of the world as a child, from Montana (where his parents had a traveling magician act) to Saudi Arabia, Peru, and Senegal. In college he was on track to teach art at the college level before deciding to become an independent artist. He went to the Dayton Art Institute, the Stuttgart Art Academy and the California Institute of Art, ending up with a Masters in Fine Art. 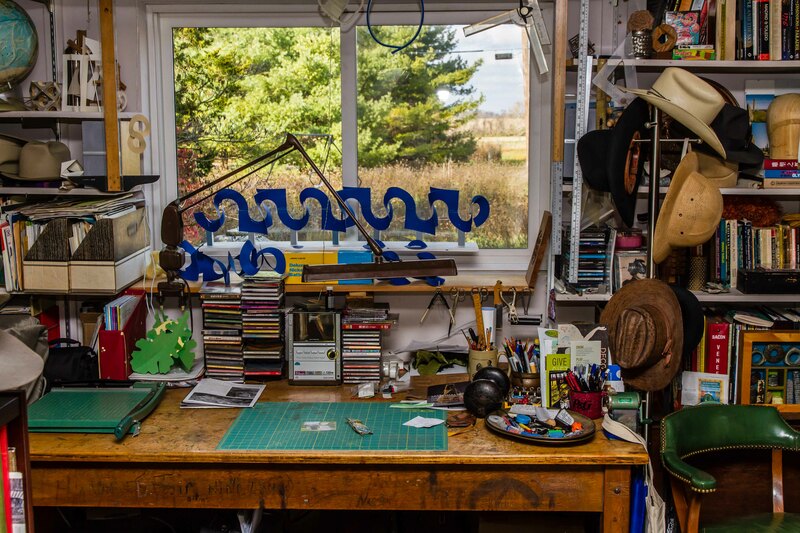 In this part of Jon’s office you see more hats; out the window is the 1 ½ acre lot that Jon has turned into a sculpture garden. 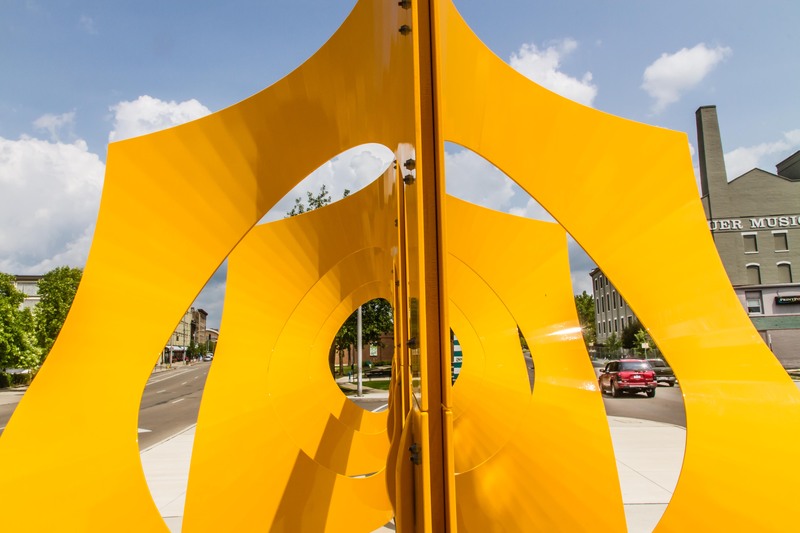 Jon’s art is made from many materials – stainless steel, painted steel, brass, bronze, fiber optic light and more. Jon added even more materials to his sculptures after a year living in Italy and studying stone-working. 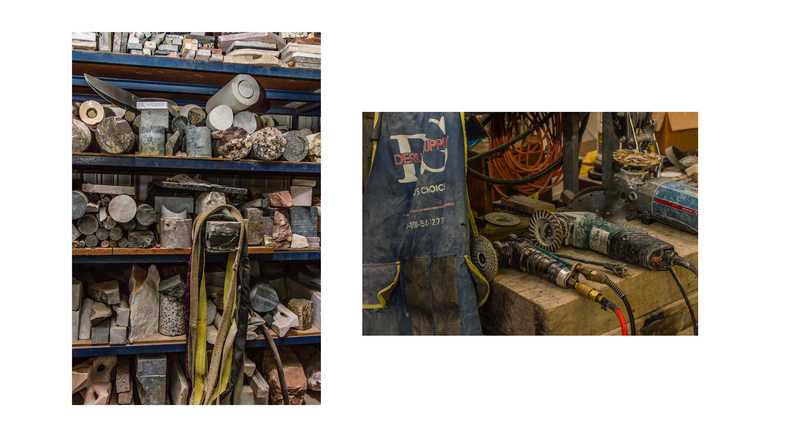 Here are some of his stone inventory and stone working tools. 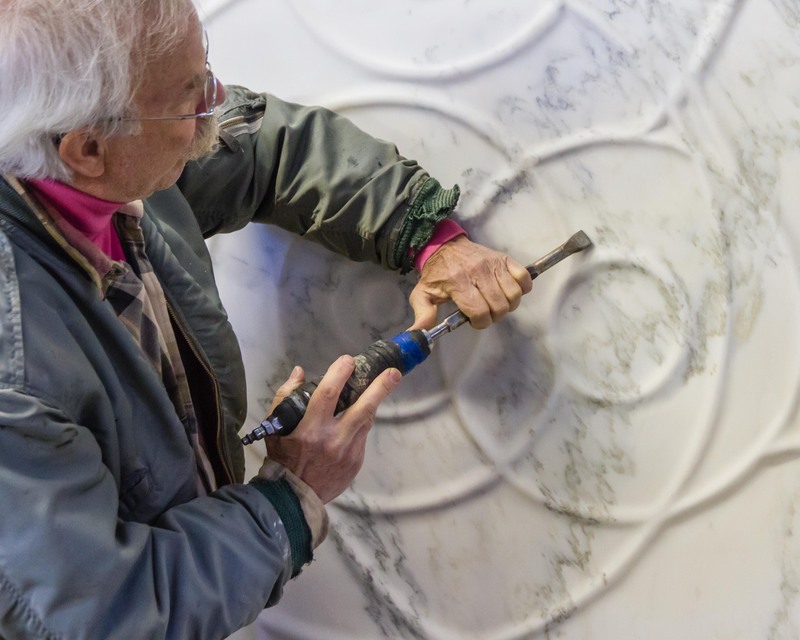 Here Jon is showing me how he worked a piece of marble, adding a series of designs to the surface. If it is not purchased by a collector, this marble may become part of Jon’s sculpture garden.